During the time when Steam was having its holiday sale, and when I also purchased Audiosurf, I found myself unable to pass up Aquaria. Since its release in December of 2007, I had been meaning to get this game. It made quite a lot of headlines back then, with it being an indie release. Not only that, but it was developed entirely by a team of two people. That in itself isn't unusual for an indie, but it isn't often that we see a result of this quality and magnitude. Derek Yu's visuals are one of the things that make this game. While the mechanics are solid, it's the artistic direction that serves in large part to distinguish this title from others of its kind. And by others, I am referring primarily to the Metroid and Ecco franchises, yet we should also consider that Cave Story was probably some inspiration here as well. 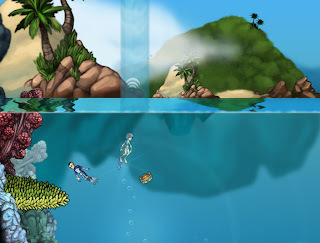 Truth be told, while playing Aquaria I often had moments of thinking how much this game reminded me of Super Metroid. I would say that this was primarily due to the tiled graphics and ambient audio. However, considering that Aquaria was created with a fraction of the Metroid team's manpower makes me have a lot more respect for this game than any Nintendo title. It's true that I am somewhat biased these days. My interests have shifted over the years from mainstream commercial games to the indie scene. I somewhat regret that I haven't stayed as active there as I was a couple of years ago, around the time that I was contributing to Indygamer (now the Indie Games Blog) and working on Copic Fighter. After that, I got a "real job" and began to focus more heavily on my art again. But I digress. The point is, that I became disillusioned with commercial games and decided to follow the independent gaming scene. So it should come as no surprise that I'd be fond of Aquaria. This game is of epic proportions, and yet it is concise enough so that someone with limited free time such as myself can get through it. I think I managed to finish this in a about 25 hours, but would have done so faster if I hadn't taken my time to get all the extras. For those who know me, saying that I actually finished a game is enough of a statement in itself! I could go into detail about how great the hand-drawn art is, and how beautiful the music is, or how enjoyable the mechanics make this game to play and explore. But I doubt I could say anything that hasn't been said already. In the end, this is just a really good game. A solid indie title that rivals any exploration "platformer" out there, and knowing that a purchase of this game supports innovation and change in a stagnant video game industry is even stronger incentive to give it a go. Grab it on Steam and enjoy this gem. Something that comes along so rarely these days.